This enjoyable, easy-to-learn card game collection is one of the most popular in the world. It features all the old-time favorites like Monte Carlo, Klondike, Scorpion, Seahaven Towers, Spider Solitaire, Cruel, Golf, Russian Solitaire, Freecell etc. BVS Solitaire Collection includes over 435 solitaire variations. 99 of them are original ones not found elsewhere. You won't find so many original games in other programs. And you can modify rules of any of the included games, thus creating your own solitaire variation. BVS Solitaire Collection gives you the plethora of statistical and scoring screens.Track your performance and progress in playing solitaire, and even publish your personal statistics on the BVS Solitaire Collection web site to appear in the top scores list. The unlimited &quot;Undo&quot; function and &quot;You are stuck&quot; feature will help you to come back and try another approach. If you are great solitaire fun, this unique solitaire games collection is your best pass to the world of computer card games! 5 new games: Babette, Cadonette, Four Intruders, Plait, Stag Party. Improved compatibility with high DPI resolutions on Vista and Windows 7 ("Large Fonts" mode); New toolbar style; New card sets "Baroness" and "Paleh"; New Card backs and backgrounds. 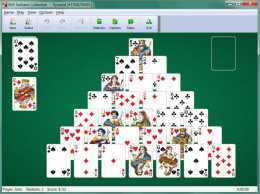 FreeCell Wizard is a solitaire game that includes the popular game FreeCell and 15 other similar games. It features lush graphics, large easy-to-read cards, sound, and in-depth statistics. A comprehensive implementation of the original Pinochle and Bezique card games (the two-player versions). Play online or against your computer. Pinochle and Bezique has a rich user interface with many customizable visual, audio, and game options. Klondike Collection is World's Largest Klondike Games Collection with 62 Klondike Games including 25 standard games and 37 original games which you will not find anywhere else. Many palms, the sun and the beach make an exotic background; nice music and excellent graphics of the game Island Pai Gow Poker win the player's favor right away!